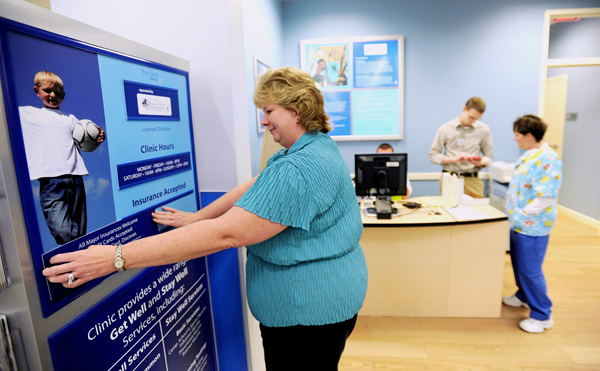 BANGOR, Maine — Coming soon to a Wal-Mart near you: walk-in health care. In Bangor, Monday marked the first day of business at The Clinic at Wal-Mart in the recently opened Stillwater Avenue Supercenter. Additional clinics will open in coming months at stores in Brewer, Palmyra and Presque Isle. Although Arkansas-based Wal-Mart has in-store clinics in many other states, the four northern Maine clinics announced Monday are the first in Maine. In Bangor and Brewer, the 680-square-foot clinics will be run by Eastern Maine Medical Center through its Norumbega medical practice affiliate. In Palmyra and Presque Isle, they will be operated by Brewer-based Eastern Maine Healthcare Systems, through local affiliates Sebasticook Valley Hospital and The Aroostook Medical Center, respectively. Acute-care services available at Wal-Mart clinics are limited to the treatment of relatively simple problems such as colds, earaches, sore throats, and minor burns and injuries. “If you have multiple health problems or chronic conditions, you don’t belong at a Wal-Mart clinic,” said Bob Peterson, director of physician practices at EMMC. Individuals who seek treatment for complex conditions or serious illness or injury will be assessed and stabilized as needed, then referred to other EMMC practices in the area, he said, including affiliated primary care offices or the hospital emergency room. Children younger than 18 months also will be referred to a local family practice or pediatric practice. Clinicians at the Wal-Mart clinics — nurse practitioners and physician assistants — can perform physical exams for participation in sports, administer tetanus shots and flu vaccines, and test for high blood sugar, strep throat, urinary tract infections and pregnancy. They will prescribe some medications, but not narcotics or psychoactive drugs. Would you go to a health clinic at Wal-Mart? No appointments are accepted. Patients who have to wait to be seen and are well enough to shop will be issued an electronic pager to alert them when one of the two exam rooms is available. The clinics will be open seven days a week, including some evening hours. At the Bangor clinic, 21-year-old Megan O’Clair of Bangor was the third patient of the day. “My throat has been hurting and I’ve been losing my voice,” she said. A strep test proved inconclusive. “They said it’s too soon to tell if it’s strep, and if it continues I should come back in a couple of days,” she said. O’Clair, who works at the Dunkin’ Donuts also housed in the Wal-Mart store, said she has no other doctor locally. Her visit on Monday was covered by MaineCare, Maine’s Medicaid program for low-income residents. The Clinic at Wal-Mart accepts all insurance coverage as well as MaineCare and Medicare. Those paying cash will be charged $50 for a standard office visit, and more for any testing or vaccines. Those unable to pay will be treated, Peterson said, and referred to EMMC’s charity care office to arrange discounts or installment billing. Raczek acknowledged that seeking episodic care at a walk-in clinic runs counter to the current trend in primary care, which seeks to assign every patient to a “medical home” — a primary care site that provides comprehensive care, maintains patient records and aggressively manages chronic conditions such as lung disease, heart disease and diabetes. Patients who come to The Clinic at Wal-Mart will be encouraged to establish a medical home with an area practice, Raczek said, and the clinic will provide medical records and other information to those medical providers. 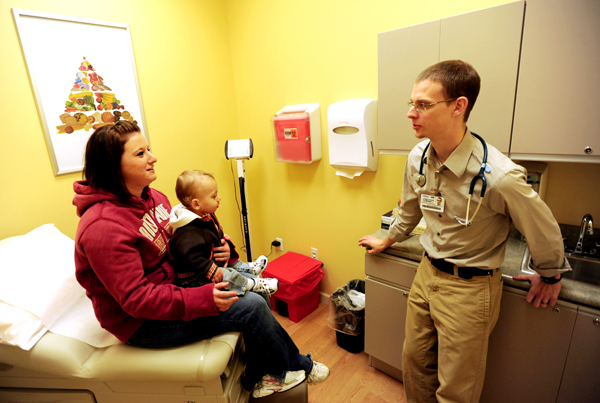 At Supercenters in Brewer and Palmyra, clinics are on schedule to open in January. The Presque Isle Wal-Mart clinic is expected to open in December.